Our paper on hybridization between Anolis krugi and Anolis pulchellus is now available in the Journal of Evolutionary Biology. As is the case with many papers, this study requires an in-house description to fully appreciate its content. Furthermore, it is important to keep in mind that Javier and I have a very long working relationship (i.e., two decades and counting) and that we both enjoy working with each other under the assumption that "you can either agree with me or you can be wrong," which provides fertile ground for intense discussions and the development of new ideas. After our preliminary results suggested hybridization between A. krugi and A. pulchellus, I blamed Javier for not knowing how to tell apart the two species. My criticism was very short-lived, when he quickly reminded me, “you agreed with every one of my species IDs." The initial results were followed up by a more extensive collection across a wider geographic region. This was then followed by more genetic work, most of which has been spear-headed by Tereza. 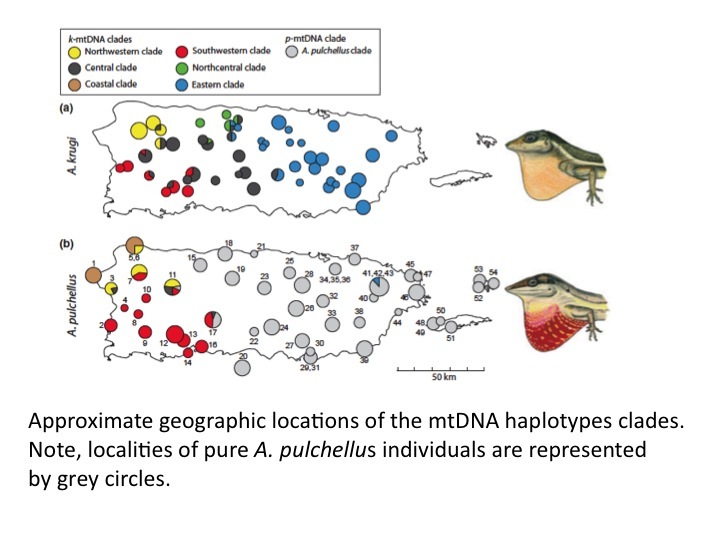 The genetic dataset, particularly the mtDNA data, confirmed the first set of results, indicating the presence of hybrid individuals across a wide range in western Puerto Rico (see map below). My first question was “can the hybrids represent a third species?” Javier's response: "Give me a break; that makes no sense. The hybrids are nested within groups of ‘pure’ individuals of A. pulchellus, and occur in multiple locations. There is no way that they can be a different species exhibiting such a pattern.” This sentiment was echoed by Tereza. I have to confess that “two against one” is not fair game. 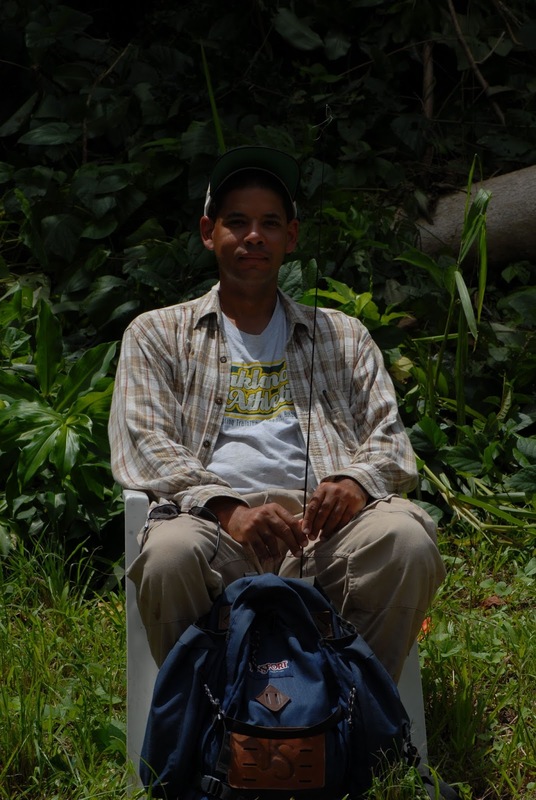 It has been great to work with Tereza on this project, as she has provided valuable insights to the development of the current hypotheses presented in the paper. In the end, this has turned out to be an interesting story. The data clearly show extensive hybridization at some point in the past. NOTE: it might be possible that some events are relatively recent; we are working on that now. If hybridization is ongoing, we can ask a diverse set of questions, so we have our finger crossed. A potentially exciting possibility from our study is the idea of hybrid advantage, which may have resulted in what appears to be a complete replacement of pure A. pulchellus by hybrid individuals across a wide range. 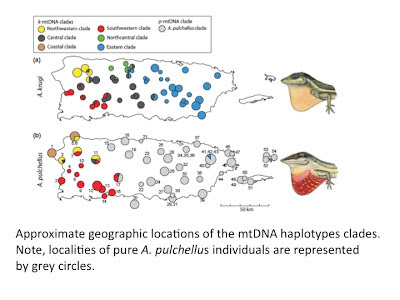 Javier's and Tereza's current working hypothesis is that the mtDNA of A. krugi provides some sort of physiological advantage to hybrids A. pulchellus allowing them to outcompete pure A. pulchellus. My working hypothesis, if there is a hybrid advantage, such and advantage is not physiologically. 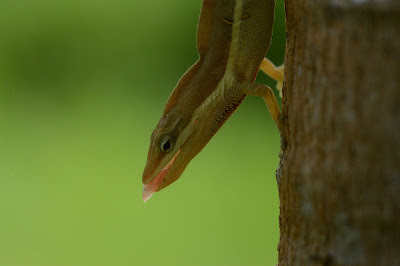 Instead it is behavioral, possibly link to levels of aggression of hybrids males. Please stay tuned, as we are beginning to tackle these questions.